So far, there are images ranging from Alexander Graham Bell’s family home in Canada to officers inspecting a wireless radio installation in St. Petersburg. I’ve also recently added a set of 12 slides showing different stages of the construction of the Panama Canal, my favourite of which is this slide showing a group of onlookers watching a blasting operation. One fun feature of the site is the ability to match up images to the current Google street view. 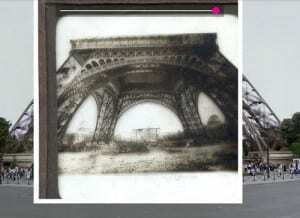 While it’s been difficult to pinpoint an exact location for many of our slides, I’ve been able to match up a small number including this one of the Eiffel Tower under construction. I’ve also added some slightly more unusual slides like this one of a total solar eclipse. 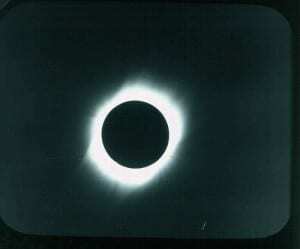 While this slide obviously doesn’t show a location on earth, the label on the slide tells us that this image was taken in Mauritius on 18 May (the path of totality of this 1901 solar eclipse crossed Madagascar, Reunion, Mauritius, Indonesia, and Papua New Guinea). Not all of the slides are that easy to identify, however, which is where we could use your help. I’ve begun adding a collection of ‘Mystery Slides’ showing unknown locations. 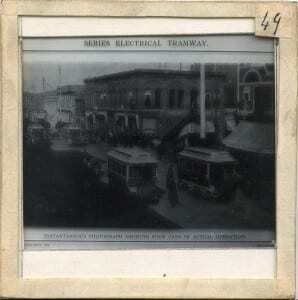 Some of these slides have brief descriptive labels or captions, such as this photograph of electric trams in operation. More often, however, they have illegible handwritten labels or no labels at all. 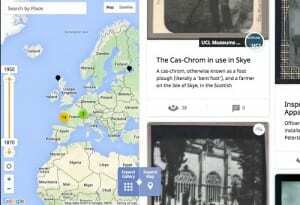 All of the mystery slides are currently pinned to the UK on the map to make it easier to view them all together. However, many of them likely show locations elsewhere in the world and once we have identified the location shown in a slide, it will be repinned to the correct place. 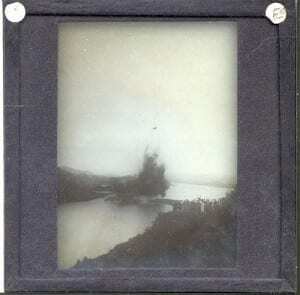 You can find this collection of mystery slides here. If you think you know where an image is located, leave a comment on the slide! Be sure to check out all the slides that have been uploaded (here’s that link again). I hope you enjoy exploring this fascinating collection as much as I have! Bethany Gugliemino is a Museum Studies MA Student at the Institute of Archaeology.